This portable garage is the best way to keep your vehicles or other equipment safe from the elements. The unique round design has a high grade steel frame. The slip fit connectors and swedged tubing allow for easy assembly. The wide based foot pads on every leg ensure a dependable sturdy base. This portable garage is UV treated and has fad blockers, anti-aging, and anti-fungal agents to protect your belongings. The white interior lining gives more light and the entire cover is tear resistant and rip-stop. Where I'm located, the strongest winds come from the south. Is it better to have the side of the shed face the wind or the door side? How long does the cover usually last? Typically, it is best to have one of the sides facing against the prevailing wind, as the curved shape allows the wind to pass over the shelter with less resistance, even though it has more area. Life of the canvas can vary widely. If taken care of and pulled tight, they can last for a decade or longer. However, heavy snowfall and thunderstorms wear on the canvas and can cause damage in as little as 3 years. Can this be closed in the front? Yes, it comes with (2) Double zippered from door panels. Where is the 8' height? My truck requires 7' entry. The 8 foot height is at the peak. The door height is 6' 9". I need a tent with a 60 lb. snow load. Is this one of those? 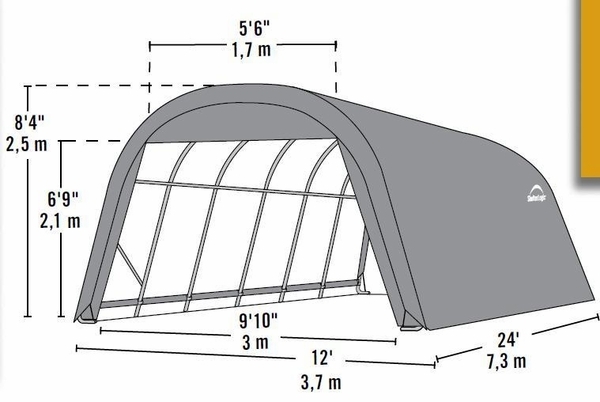 We have the ShelterTube Snow Load Rated Shelter that has a now load rating of 43 pounds per square foot when anchored properly as indicated in the product manual. Do you have replacement covers? No. 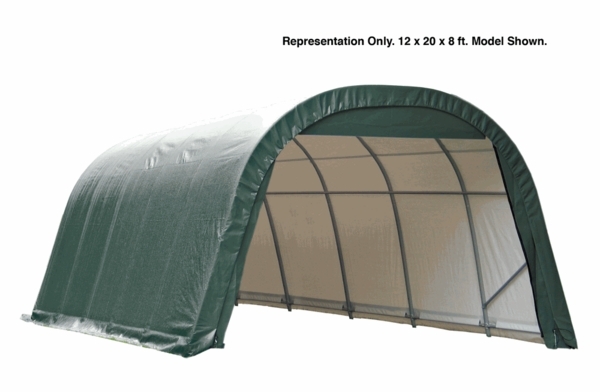 You will need to contact ShelterLogic directly to get replacement covers for that product.